I wish I could assign a track to more than one buss in Samplitude. I know, you couldn't do that on old Gamble consoles either. But it's nice to be able to push a button to send the signal to more than one buss. One of the advantages to using auxiliary sends to create a drum submix buss rather than a group buss is that it can be easier to setup whether that submix is pre or post fader or pre or post EQ and other effects. So maybe I'll live with aux sends. Still, more submix busses would amuse me. Actually, the best way to deal with that is to simply copy the data from one track to another — that way you can apply whatever routing and effects you want to each sound or groups of sounds however you like. Parallel processing. It's the way. I think. For drums. The Minimoog for iPhone amuses me greatly. 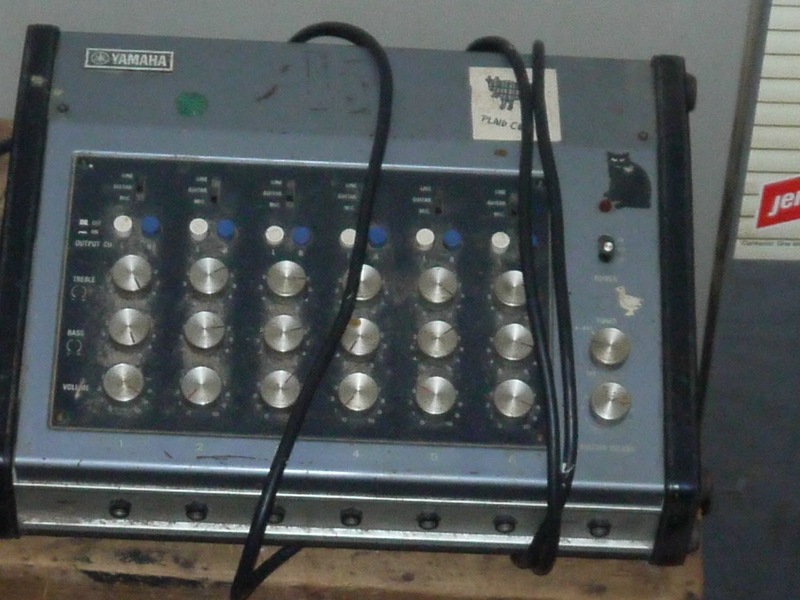 Sometime 'round about 1981 or maybe '82 I went to New York with my brother David and bought this power amp and mixer from some pawn shop. Look at that power switch. It's one of those power-polarity-inverting switches. You can select which output each channel is assigned to. There's power amp outputs and line-level outputs. I did a lot of recording with this thing. See that top knob on the tuning section? That gives you a 440A at whatever level the master volume is set. And it's variable +/- something. It was fantastically irritating if you turned it on. I do have a kind of fantasy about miking drum kits with only two mics. And I'm getting closer to figuring out how to do it practically. The further one puts the mics the better it sounds. The big issue is that all the other instruments get into those drum mics. Using just the room mics can't be that big a deal. I mean, why don't people do that all the time? I realized how much I liked the room mics when we recorded that first Tyrannosaurus Mouse album at Trax East. Nothing new this fortnight on Taxi that seems right for me to submit to.